The Metropolitan Professional Compact line includes two Compact Canister models with and without power nozzle. All Canister models incorporate an industrial quality, twin-fan motor that cranks out an impressive 4.0 Peak Horsepower (more than units selling for twice the price!) and a 4-stage, HEPA-certified air filtration system that traps 99.97% of all airborne allergens, dust and animal dander for a cleaner, germ-free home environment. Great for removing Pet Hair from upholstery, stairs, car interiors. The Metropolitan Vacuum Cleaner Company has announced a significant upgrade to their High-Performance Metro® Professional line with the addition of a new, “state-of-the-art” electric power nozzle assembly. The new assembly compliments the line with both its stylish, “retro” appearance and its superior performance. 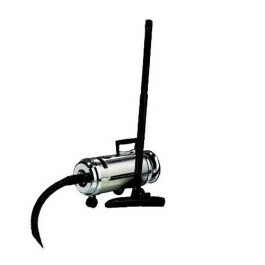 Highlights of the new power nozzle assembly include an electric hose equipped with ergonomically correct pistol-grip with fingertip on/off switch; smooth telescoping extension wand; low-profile power head design with dirt-seeking headlight, full-time edge cleaning ,a convenient toe-touch switch, enabling the power head to go easily from carpet to bare floors, and a durable, all steel beater bar.